Get to know the Support Coordinator behind the sounds at Output. I’m the technical support guru! *Ohmmmm. * When our customers have any questions about our software they come to me for help. Our user base is a highly creative group of people — mostly all musicians who are smart and talented. I get to interact with a lot of interesting people and guide them through problems which feels good. Say hi to me in the emails! But only if you have a real question too. A typical day at Output for me is coming in to greet my smiling coworkers, then brewing up a piping hot cup of tea or coffee. Then I pop open my laptop and head into our support portal to talk with customers from all over the globe. Together we work through any difficulties with downloading, installing, or using our software. It’s great being able to help people out, especially when they come back and tell you how much they’re enjoying our instruments. (Warms my heart man!) Through my work I get to do a lot of educating about how our products work. That in turn teaches me a lot about our software, which is great for me because I use our stuff in my own music all the time. At least a few times a week I’ll pop into one of the sound rooms at the end of the day to work on my own music or jam out with a coworker as well. For example, I made a track for my electronic project HOUNDTRACK with my coworker & film composer Nestor using EXHALE, SIGNAL, and MOVEMENT. Darjeeling’ is a good example of my favorite part about Output — my team. Everyone here is either a musician or a music fanatic and they’re all eager to jam. I’ve gotten to make music with several of them and I learn a ton through the collaboration process. I started playing drums in my garage on a plastic trash can when I was about 8 years old. My Dad played when he was younger so he inspired me to get into it by teaching me paradiddles. Also my Mom is musical — she sings in choirs. Basically I got lucky and was born into it. My trash can drumming career didn’t end when I was 8. In middle school, my drum teacher Craig started a STOMP-esque group called Boom Chaka where several drummers and I played on trash cans and buckets all over Santa Barbara. This was my first foray into organized music and I’ve been doing it ever since. Now I play drums in a band called Bearer with my friend Jedd. We have yet to play a show, but trust me it’ll happen — keep your calendars open for 2019. On the electronic front, my brother Alex and I started using Fruity Loops to make beats during middle school as well. He was making Final Fantasy-esque type music while I was doing more hip-hop beats. I soon moved onto Ableton Live and started recording my friends playing bass, guitar, and singing in our garage. Alex stopped making tunes for a while but has since revisited it, and now we jam all the time. Yoga. Every single day. Just kidding. But I do try to exercise often and I’m a firm believer in getting eight hours of sleep each night. Meditating several times a week using Headspace has also been an awesome tool as well. If I can do those three things on a given day, then I really feel in the zone. I also have a fun crew of guys that I make music and DJ with called Needthat. It’s a pretty sweet way to blow off steam. On top of having fun, we all help each other get better at making and performing music. You can do a lot more with others as a team than you ever could by yourself, so I love the crew. Catch us DJing at Wurstkuche in Venice on the last Wednesday of every month. Currently I’m working on an EP for my electronic project HOUNDTRACK. Up until now I’ve worked on music on a song-by-song basis, but I’ve always wanted to put out a collection of music all at once. I think it can be a cool little time capsule that captures how I’m feeling at the time. It’s similar to how you hear a song you were obsessed with in high school and it reminds you of the spots you were when you listened to it and the people you were with. Putting out your own music then listening back on it later gives you a really interesting glimpse into your past. When it comes to wrapping up tracks I sometimes get too caught up in everything and have a hard time finishing. Based on conversations I’ve had with other musicians I don’t think I’m alone there. To get my EP done I’m using a website called https://gofuckingdoit.com/ which is a service that has you put money on the line for a project you want to finish. I pledged $250 that I’d finish my EP by the end of February. Once the deadline comes around, my brother decides whether or not I completed the task. If I release the EP all is well and I’m not charged anything. If I fail my $250 disappears into the pockets of the website’s founders. There’s no way I’m giving those dudes my money — that’s like a month’s worth of Chipotle. I’m really into the sounds of ASMR — autonomic sensory meridian response. It’s an interesting phenomenon where you get a nice tingling sensation from listening to binaural sounds. There’s a visual aspect to it also, like cool hand motions etc., but I’m more into the audio. Sounds weird I know. But hey, I like what I like. I’m working on incorporating ASMR sounds into my music by using my Zoom microphone to record sounds, then putting them in the background of my tracks. Here’s a demo of a song I’m working on where you’ll hear some whispering, crumpling, and various other pleasing clicks and clacks. I really like EXHALE. It was the first one I heard before I worked here and I was blown away by it. I wasn’t too familiar with VSTs at the time, so when I found out you could use the vocal parts of EXHALE in your own tracks it seemed too good to be true. Also I think the presets in EXHALE are just 🤑. I’m definitely guilty of being a preset-basher – meaning I enjoy using VSTs right out of the box with minimal tweaking of presets. 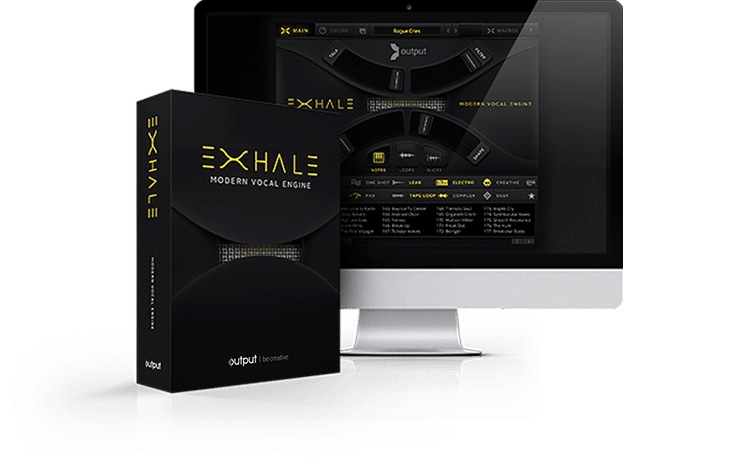 EXHALE is perfect for that because so much time went into creating the original presets that they sound glorious as they are. Our standalone effect MOVEMENT is also a fun tool to add to tracks when you want to create some space and interesting rhythms, especially with the addition of reverse delay in the newest update. I have yet to master all that MOVEMENT has to offer but I intend to conquer it soon. EXHALE is a playable vocal engine built for the modern music maker.